8 personnes ont voté, soyez la prochaine ! Mac OS X does not support writing to Microsoft Windows formatted NTFS volumes out-of-the box. The solution is here. Tuxera NTFS for Mac is our commercial read/write NTFS software for Mac users. 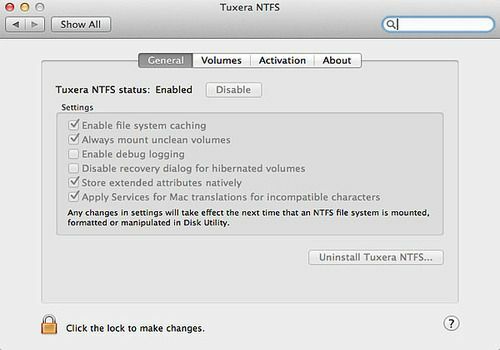 It builds and extends upon the proven stability of Tuxera's popular open source NTFS-3G to deliver a full featured, commercial grade NTFS driver for your Mac. With Tuxera NTFS for Mac you can access your Windows disks as easily as any Mac disk. Tuxera NTFS for Mac delivers the fastest NTFS data transfer speeds you can have on Mac while protecting your data with its new, smart caching layer. The software has full support for the new 64-bit kernels introduced with Snow Leopard and OS X Mavericks., and comes with advanced features only available from Tuxera such as support for NTFS extended attributes. Tuxera NTFS for Mac is compatible with popular virtualization and encryption solutions including Parallels Desktop, VMware Fusion and TrueCrypt. 15 Languages supported: Arabic, Simplified and Traditional Chinese, English, French, German, Italian, Japanese, Korean, Polish, Brazilian Portuguese, Portuguese, Russian, Spanish and Turkish. Verify and repair disks integrated in Mac OS X Disk Utility. Auteur / Editeur du logiciel gratuit : Tuxera Inc.
Laisser un commentaire sur Tuxera NTFS for Mac 2018.02 Merci de rester correct et de respecter les différents intervenants.